To first understand how the ninjas were recruited and trained, requires a little more than the actual facts of their how they were brought into the fold of a clan or training group. It’s important to understand that in the 15th century the Sengoko period was heavily favoured to the samurai and their families. These samurai families were the ones that first started to develop the skills of the ninja warrior. As was traditional in Japan, the passing down of martial arts skills was commonplace, and these families also passed down their skills, including the art of ninjutsu. So, the first ninja were really grown from the training passed down from generation to generation, and these skills were obviously of use to the daimyo, the feudal lords of the time. This need for skills was often in imbalance however and over time the number of ninja available was often not enough for the daimyo leading to the introduction of an official training program. Of course, the small samurai families that passed down these ninjutsu skills from father to son, or sensai to student would not satisfy a larger need. This demand for more ninja to carry out essential espionage, stealth and subtle tasks required a more industrial approach to the ninja training, and this led to what could be considered ninja training schools. Once a ninja was recruited they would be trained at a ninja school, either held privately by a family, or by one of the Japanese lords the daimyo. The first training schools known to exist were the Iga and Koga ninja schools, which were first mentioned in history around 1487. Of course theses schools likely existed much earlier, but were the beginning of the Ninja school. These schools were literally a collection of families, passing down the skills from generation to generation. These training schools were to be the future for the growth of the ninja, who were much in demand because of their valuable ninjutsu skills. 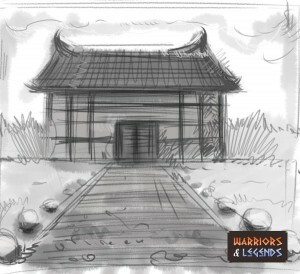 It’s told that not every daimyo could run these schools however, and only the wealthiest of the daimyo could officially run these training schools. This of course does not mean that the way of the ninja was not taught in private however. The very nature of ninja training is something that would be intrinsically linked to a stealthy training operation, and its likely much of this occurred in the 15th century in feudal Japan. 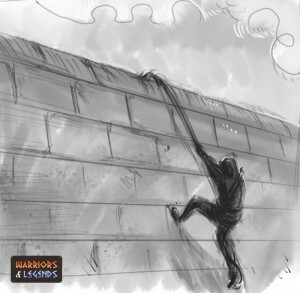 If a ninja warrior was successful they would learn all manner or ninja skills, like wall climbing. So now we know that the first origins of the ninja schools started with the Iga and Koga ninja families, the recruitment process was simple. If you were born into a ninja family you would train in many skills from a young age. Later as the demand for ninja’s grew, and Tokugawa Ieyasu took many of the ninja from the Iga and Koga clans under his control, the existing daimyo of the time had to look for other sources. This would be when the skills of Ninjitsu began to be passed onto non family members.